This is the second part of our guide to Best Women’s Watches Under 500. In the first part, we shared our recommendations for the best automatic and quartz watches for women. Now we’re going to take a look at the best women’s sports watches you can buy for less than $500. Why do you need a sports watch? Truth be told, your smartphone offers all features and functions of the classic sports watches. Then why do you need to buy a sports watch, in the first place? Have you ever tried hiking a rocky mountain trail with a smartphone in your back pocket? Or doing a workout at the gym with your iPhone strapped to your arm? I can assure you that’s not a great experience. Also, sports watches are not just more convenient and useful for most sports activities. Sports watches (and particularly the models with analog displays) are also stylish and are designed for a variety of occasions so that you can wear your sports watch (almost) everywhere. What is the type of sports watch you need? Your choice of a sports watch should be determined by your favorite activities. For example, if you enjoy cycling, a stopwatch (or chronograph) feature is a must, heart rate monitor and GPS tracker are desirable, but you definitely don’t need a watch which is water resistant at 100 meters. The chart below gives some guidance on the features you need for the most common types of sports activities. As a general rule, the sports watches should be water resistant to at least 50 meters. 50 meters water resistance, however, does not mean that you can dive to 50 meters. Water resistance standard has always been somewhat misleading and confusing to customers, and the reason is that it refers to static pressure and not to the actual depth of the water. A Blog To Watch has a great, detailed article on the subject. Please refer to the chart below (from the said article) for a visual guide of what you should NOT do with your watch according to its water resistance rating. Ease of use and ergonomics. Women’s sports watches are stylish, lightweight and practical. You can choose a watch with a silicone or rubber strap, or metal bracelet. For active sports, soft materials are preferable. The display (should it be analog or digital) should be clear and easily readable, and the buttons should be big enough and easy to find and press. Online retailers change their list prices sometimes, and that’s good because they often have sales campaigns, hot weekly deals, and clearances. Sometimes, however, the prices may increase, or a certain item may become temporarily unavailable. That’s why a certain watch from our list may not be available or may cost more than $500 by the time you check the price, although we are making every effort to keep the list up to date. In this case, please let us know through our contact page or drop us a line at admin@watchesunder500.com so we can make an update. 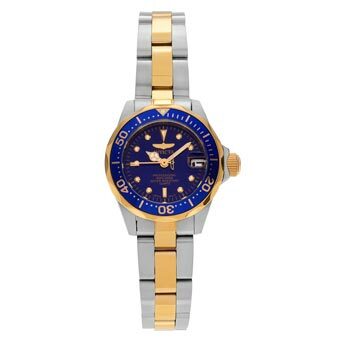 Hint: Even if the watch you are looking for is out of stock, chances are you will find a similar one in “other items you may like” section on the retailer’s online store. Citizen’s Celestial is true watchmaking masterpiece, a perfect blend of modern technologies and classic watchmaking tradition. Eco-Drive technology ensures that your Citizen Celestial will always show the exact time and will never run out of battery. The fashionable two-toned case refined champagne colored display will look equally adequate in (almost) every occasion. 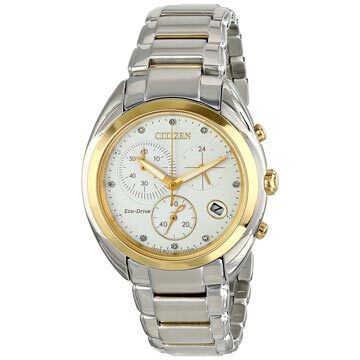 Citizen Celestial features a 1-second chronograph measuring up to 60 minutes, 12/24-hour time and date, and – for some extra charm – the dial is accented with the eight white diamonds. One doesn’t use ‘tough’ and ‘feminine’ in the same sentence – not very often at least. 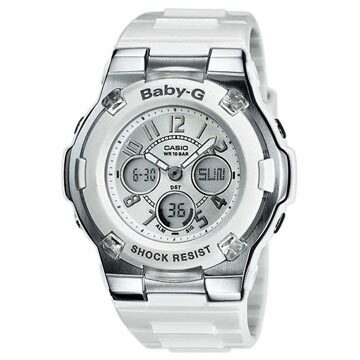 But this Baby-G Casio is tough and yet very feminine. The durability of Casio’s G-Shocks is legendary, and – unlike most G-Shocks – the appearance is airy and clean. The watch features world time display, three alarms, 1/100 second stopwatch, and auto-calendar. The white resin strap and 100 meters (330 feet) water resistance make it a perfect accessory for the hiking trail. * Overstock gives their customers the option to select (for an extra charge) between 2 or 3 years warranty on every purchased watch with their Jewelry Protection Plan. The listed price of the watch does not include this warranty. On Overstock.com site, make sure you select the desired Protection Plan from the Warranty dropdown before you order! 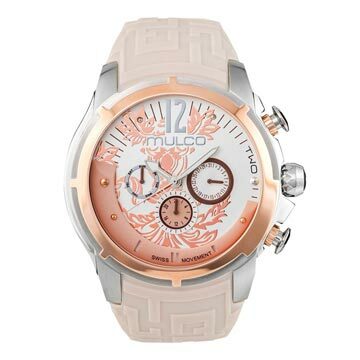 The suggestive, slim design of the Maze collection watches by Mulco is hard to remain unnoticed. Although the watch feels solid and massive, the vibrant, playful colors and original textures makes it so undoubtedly feminine. Thanks to the silicone strap and 100 meter water resistancy you will feel equally comfortable wearing it on the beach or in the gym. 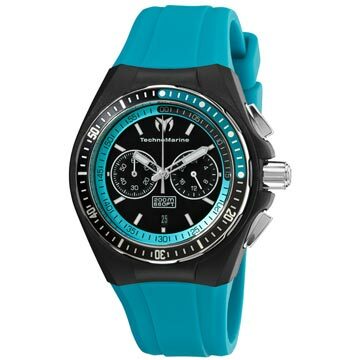 Although Technomarine Cruise is proclaimed as ‘Unisex’ watch, it will look much more attractive on a female’s wrist. A 40mm case may sound quite big for women’s watch, but for a sports watch that’s an ideal size. The watch is solid and unassuming but feels very comfortable and lightweight. The stainless steel case is protected by interchangeable black plastic cover – a feature which is quite unusual but could be very handy. The silicone strap is available in several different colors and is also interchangeable, so you can easily match your Technomarine Cruise to your style. 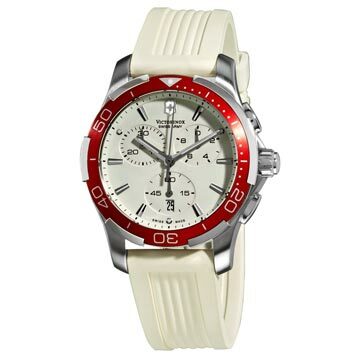 The Victorinox Alliance Chronograph is probably the best women’s sports watch in our selection. That’s exactly how a women’s sports watch should look like – a perfect blend of bold design, Swiss precision, immaculate functionality – and all that at very affordable price. The watch features luminous hands and indices, 100 meters (330 ft) water resistance and three subdials: small seconds at the 6 o’clock position, chronograph 30 minute counter at the 10 o’clock position and a 1/10th of a second counter at the 2 o’clock position. There are not so many watches that combine sturdiness and comfort in such beautiful way. And there are just a few watches featuring precise Japanese automatic movement that cost less than $200. Although with a water resistance of 100 meters Seiko 5 Automatic it is not a diver watch, it looks like one and is equally suitable for hiking and water sports. The transparent case back and unidirectional rotating bezel with compass markings make the watch even more irresistible. You don’t get a deal like that every day. 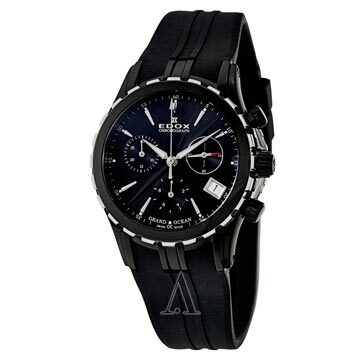 A true Swiss made chronograph watch by Edox, sleek and black, featuring 30 Minute, 1/10th Second, Central Second and Small Second registers, protected by scratch-resistant sapphire glass, water resistant at 100 meters… for less than $500! If you like surfing and snorkeling, that might be the right watch for you. 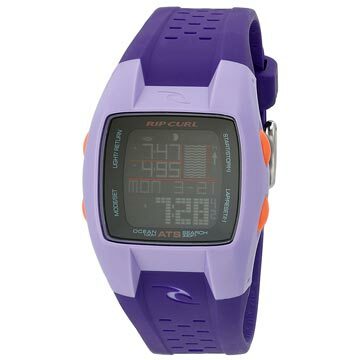 Rip Curl Oceansurf is lightweight and shock resistant, but most its important feature is the Automatic Tide System – Rip Curl’s patented averaging tide system, which not only includes tide charts for 200 preset beach locations worldwide but can also be easily set to work at every other desired location. The calendar shows day, date, month, year, and moon phase. The watch is available in many other different colors – just pick your favorite one! Although Invicta Pro Diver does not offer chronograph function (which is sort of mandatory attribute for sports watches), it is solid and elegant and would be an excellent accessory for your daily gym workouts. The watch is water resistant at 200 meters (660 feet) and, although it is surprisingly small for a diver watch, it features unidirectional rotating bezel, luminous hands and indices, and magnified date window – like any other ‘real’ men’s diver watch. In short – this is a GREAT watch. One of the best women’s sports watches you can buy for less than $500. 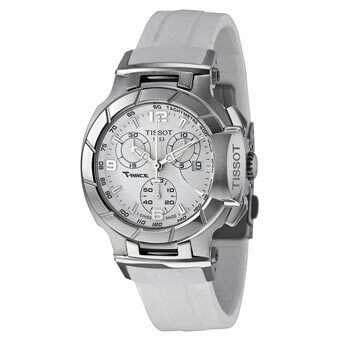 You can get much more information in our detailed review of Tissot T-Race Chronograph. Although ESQ by Movado is a bit large for women with small wrists, don’t forget that’s a sports watch and the sports watches are simply designed this way. Besides that, you will probably so much love its gleeful, brightly colored look that you will enjoy wearing the watch even if it feels a little on the bigger side. 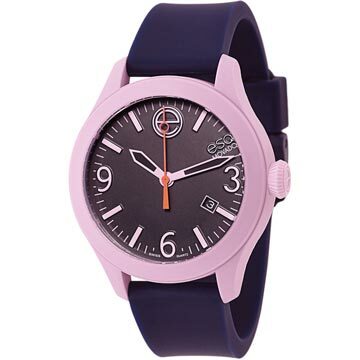 ESQ by Movado is offered in a variety of colors, and you will easily find your favorite one. And most importantly – the price is more than fair for a Swiss watch with screw-down crown and water resistant up to 100 meters. This is probably the best sports watch you can buy if you are looking for functionality over the design. Garmin Forerunner 235 is all about functionality. It does not look as attractive as, say, the classic Swiss mechanical sports watches, but it offers zillion of useful features which mechanical watches simply can not have by design. 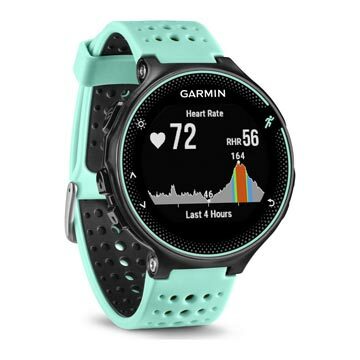 Along with the pretty much standard time/date, stopwatch and chronometer functions Garmin Forerunner 235 features GPS navigation, accelerometer, step counter, heart rate monitor… the list goes on and on. These features make the watch suitable for virtually every type of sports activity. A feature unique to Garmin is the wrist-based measurement of the heart rate (as opposed to heart rate measured via radio transmitter on a belt across the chest). * All Garmin watches come with one year Garmin warranty, which obviously violates our rule for at least two years manufacturer’s warranty of all watches we recommend. 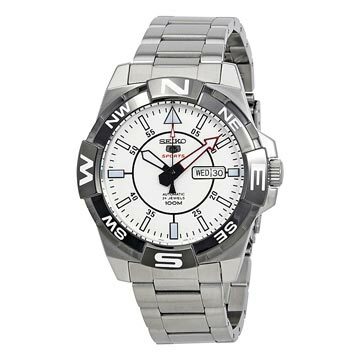 Nevertheless, we decided to recommend this watch due to its unique features. Suunto M5 does not offer a bunch of features. Apart from the standart for most of the sports watches features, M5 can do just one thing – but does it perfectly. 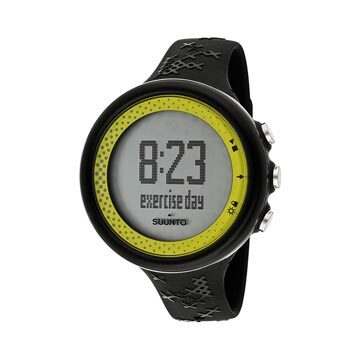 If you are looking for a watch that will monitor your everyday fitness or jogging activity, then look no further.